Size small. Dated 1/62. Fitted with the earlier type 54 microphone and standard webbing harness. 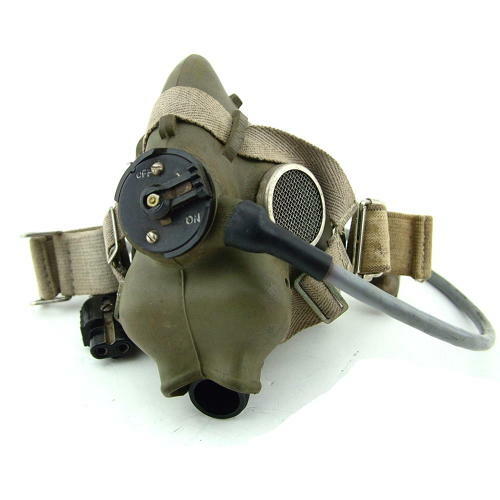 The rubber facepiece retains good shape, is clean and very flexible. There is some cracking around the microphone, inspiratory valve, harness lugs and underside of the mask if flexed. The pearl grey suede lining has minor soiling suggesting only light use. The harness is grubby but retains elasticity. The microphone is wired with an unusually long non-standard loom. A good used mask. Stock code O16511.